Awesome sales teams aren't only found in office cubicles, and if you have a remote sales team, they have probably forgotten what cubicles look like. A salesperson might attend a CEO meeting in California, play a round of golf with an important client in Georgia, or cold call prospective leads from an apartment in Barcelona. If your salespeople travel more for work than they stay put, you have a remote sales team – or at least some of the challenges of managing one. Fortunately, technology makes remote work more accessible. The office now encompasses different countries and time zones. A Stanford University research study found that employees are 13% more productive when working remotely. However, managing a remote sales team isn’t easy. The basic principles of sales management still apply, but when problems occur, it's not as simple as getting up from your desk and walking down the hall to get clarification face to face. Managing remote sales teams creates unique challenges, but you can overcome them. Let's explore four ways to lead your remote sales team to more closed deals. When setting expectations, encourage sales employees to meet higher performance levels. A recent Gallup poll of German workers found that when a manager sets clear priorities for their employees, about 38% of workers feel engaged and will strive to increase their work performance. Establish clear expectations for your remote sales team. It provides everyone a set standard to maintain. The benchmark should include sales objectives, specific online procedures when working on leads, and tips for managing time more efficiently. Sales managers must be willing to hop on a Skype call with their remote sales team to discuss expectations. Also, provide a detailed report to each employee about their specific tasks and the desired performance goals. Similar to in-person communication, go over the ground rules on how to find leads, what to do when cold calling prospects, when to perform follow-up work, how to close the deal, and the procedures on what to do if they experience any problems. Don’t let your sales team wander in cyberspace. Remote work requires expectations, too. About 74% of businesses already have or will have a bring-your-own-device (BYOD) procedure for their employees. Most companies work in the cloud. Storage providers, like Google or Box, allow your employees to log in securely and view any data. It seems cloud computing has diminished the need to have remote workers on a virtual private network (VPN) but they can still be set up for additional access, security and control. Use of cloud-based storage systems means workers can access company information from their personal computer at home, or their smartphone while on the go. Sometimes, they'll access documents (with permission) on a prospect's computer using cloud storage systems. Cloud sales software allows team members to update prospect records from any device. Using cloud software ensures that every member of your remote sales team has the information they need exactly when they need it. And that allows everyone to receive the most up-to-date information. Yet, companies often forget to optimize work templates and documents for employees. This can hinder employee productivity as each device displays information differently. Creating a BYOD policy also requires that you consider tools, documents and other resources carefully to ensure all members of your team receive proper access. If you want to manage a remote sales team effectively, you need to invest in tools that match their work environment. If your team needs remote access, you need a mobile CRM. Hire people you trust; trust the people you hire. In 2013, a Harvard Business Review report demonstrated that people avoid helping others when they lack trust in their teammates or managers. If you don't think your actions will be rewarded or reciprocated, why make the effort at all? This problem can be exacerbated in sales teams, which often structure goals around individual accomplishments. And when you have a remote sales team, it takes extra effort to build trusting relationships. After all, you don't see each other in the office every day. Communication is key to building trust. 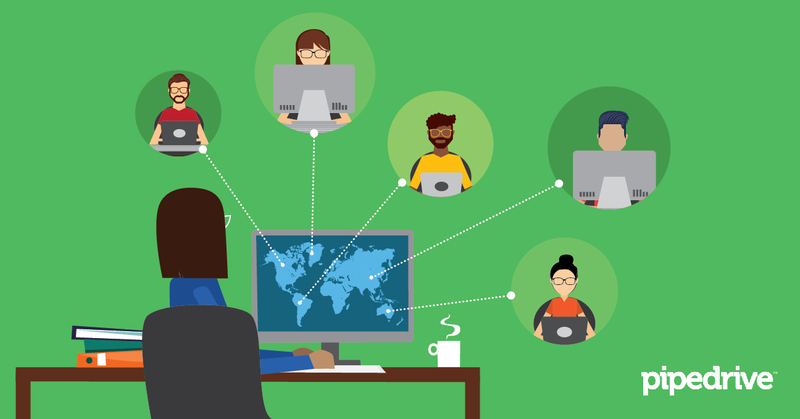 You've heard that before, but it becomes more important in remote teams. Sales managers should plan their working schedule to overlap a majority of their team members. That way, if any issues or questions arise, you can respond immediately. When you pay attention to your team's needs — even when they can't physically tap you on the shoulder — you build trust. However, you also must avoid micromanagement. While this can be a challenge in a typical office setting, the negative effects of micromanagement also expand to remote teams. As a manager, your communication isn’t always immediate, and you cannot interpret your team members’ body language or learn their mannerisms. Micromanagement itself can become self-defeating for remote sales teams. As long as they close deals, give your team the opportunity to work freely. Plus, research shows that employees who have autonomy over their schedules work harder. Build trust. Start by communicating effectively with your remote sales team. Promote positive interaction among your team members. Holding weekly meetings opens the lines of communication. It’s a great way for the team to learn from one another. For example, a sales rep can fully explain a new technique he uses with reluctant buyers. Or someone may share a success story of how they closed four deals in one day. Hearing the voices of your co-workers brings life to the remote job setting. Moreover, scheduled meetings with the team streamline the process of addressing major challenges and brainstorming complex sales strategies. Everyone benefits from the participation. Be mindful that meetings shouldn't just focus on work 24/7. Remote sales teams lack the watercooler moments. So, stimulate discussions around everyday topics, like the latest viral meme, a sporting event or the happenings in your city. Building camaraderie combats workplace loneliness — and sparks good vibes around the virtual office. Give your team the space to learn about each other outside of day-to-day operations. It will make meetings more productive and build healthy team relationships. Do this well, and you’ll be able to close more deals with an engaged, empowered and effective remote sales team. Learn how to prevent and overcome failure for your sales team. This 18 page ebook will help you develop plans for hiring, firing, and managing a crisis.